Playstation All-Stars: Battle Royale "Nearly identical to the PS3 version"
SuperBot Entertainment isn't developing the PlayStation Vita version of PlayStation All-Stars: Battle Royale in-house — it's being handled by Austin-based Bluepoint Games — but playing the game on Vita, you'd have to look long and hard to notice any differences between it and its PlayStation 3 counterpart. 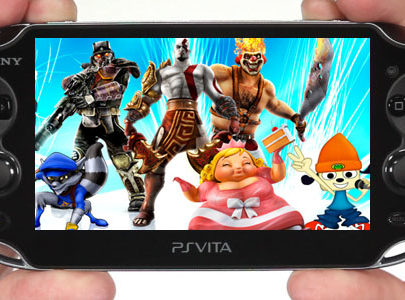 Battle Royale supports Sony's "cross-play" functionality, which means that the PS3 and Vita versions of the game can talk to each other. In this case, the content is identical between them, and they're so well integrated that a four-player online match can feature any combination of local and networked players on PS3s and Vitas. For instance, you and your sister can sit on your couch in New York with the PS3 version, and fight your Vita-owning cousin in San Francisco and your London-based uncle on his PS3. Both versions run at 60 frames per second, and in a controlled environment — with a wireless router sitting a few feet from a Vita and a PS3 playing together — I couldn't see any lag between the two. Chris Miranda, an associate producer on Battle Royale at Sony Santa Monica, showed this off by holding the Vita up to the TV during the pre-match cutscenes: they played at the same time. The responsiveness was so impressive that I had no problem using the Vita as a controller, simply inputting commands on the device in my hands while watching the action play out on the much larger screen in front of me. I wasn't just doing that for novelty's sake, though. The Vita sports a gorgeous display, but at 5 inches, I found it somewhat inadequate for following the spectacular action in Battle Royale. Even SuperBot community manager Daniel Maniago conceded that "a game like this is kinda chaotic," when I asked him about that concern. To that end, Bluepoint is in "constant communication," according to Miranda, with SuperBot in order to ensure the best experience for both Vita and PS3 players. The camera is a particular area of focus for the Vita version. It did seem slightly different from the view on the full-screen PS3 game, and while Maniago refused to say that Bluepoint is making "compromises" in the Vita experience, he explained that the code for its camera angle takes into account something called an "area of interest." Battle Royale on Vita features some camera tweaks in order to optimize the game for the handheld. It constantly analyzes the "area of interest" in a match, and adjusts the view accordingly to give Vita players a fighting chance. This way, the camera isn't always quite as zoomed out as the console version. In addition, the camera on both platforms is less dynamic than in, say, a Super Smash Bros. title, another helpful idea. SuperBot also experimented with the icon above each character's head. They tried having it disappear contextually, and tested varying sizes, but eventually settled on leaving it visible at all times to help players track their fighters. Let us know what you think the frame rate should be in the comments below!